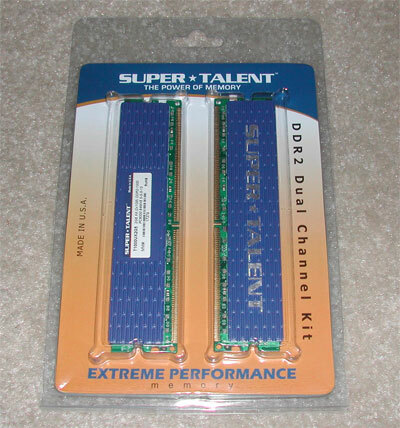 It was only a few months prior that we had our first experience with a DDR2-1066 kit from the likes of Super Talent. Since that time, Super Talent has been making headway into the enthusiast market with improved products capable of higher frequencies at lower timings. The modules we’ll be taking a look at today belong to the T1000UX2G5 2GB DDR2-1000 kits. This is the C5 kit that Super Talent offers, however they do also have a C4 kit that we hope to take a look at in the near future. 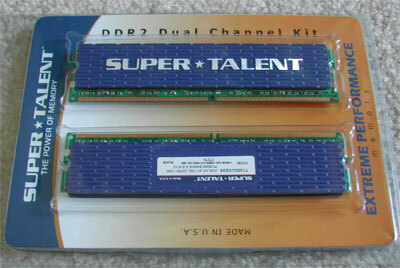 Super Talent still isn’t exactly the most well known performance RAM manufacturer out there. In fact, they likely aren’t even one of the names that come to mind to an enthusiast when they think of performance DDR2. Most will lean towards the well-known industry powerhouses like Corsair and OCZ, but those kits typically come with a name premium attached. The last kit from Super Talent left us feeling good, will it continue with these T1000UX2G5 modules? Read on to find out! ..:: Super Talent T1000UX2G5 Specifications ::..
As you can see from the specs listed above, these modules are competitive with their rated frequency and timings required to achieve said frequency. Unlike what we found with the DDR2-1066 kit, this time Super Talent does indeed provide a rated voltage for reaching the 1000MHz rated frequency, 2.2V. This is a typical voltage for achieving such a high frequency. In terms of product packaging, minimalist is the way Super Talent seems to go. This time there was a little more to it with an information card, but in comparison to some of more in depth guides offered by the big boys, this certainly left a little to be desired. The modules themselves are both double-sided. The blue, cast aluminum heat spreader is affixed on both sides of each module and should provide adequate cooling for the chips. These heatspreaders felt much more substantial than those found on the DDR2-1066 modules reviewed previously. They also looked much nicer. A sticker declaring all of the information about the modules is placed on one side in the center of the heatspreader.